The code for the project is available for sale. Please contact raghavendersahdev@gmail.com for more details! "Integrating Stereo Vision with a CNN Tracker for a Person-Following Robot", By Bao Xin Chen, Raghavender Sahdev and John K. Tsotsos, In the 11th International Conference on Computer Vision Systems, Schezhen, China, July 10-13, 2017. "Person Following Robot using Selected Online Ada-Boosting", Bao Xin Chen, Raghavender Sahdev and John K. Tsotsos, In 14th Conference on Computer Vision and Robotics, Edmonton, Canada, May 17-19, 2017. 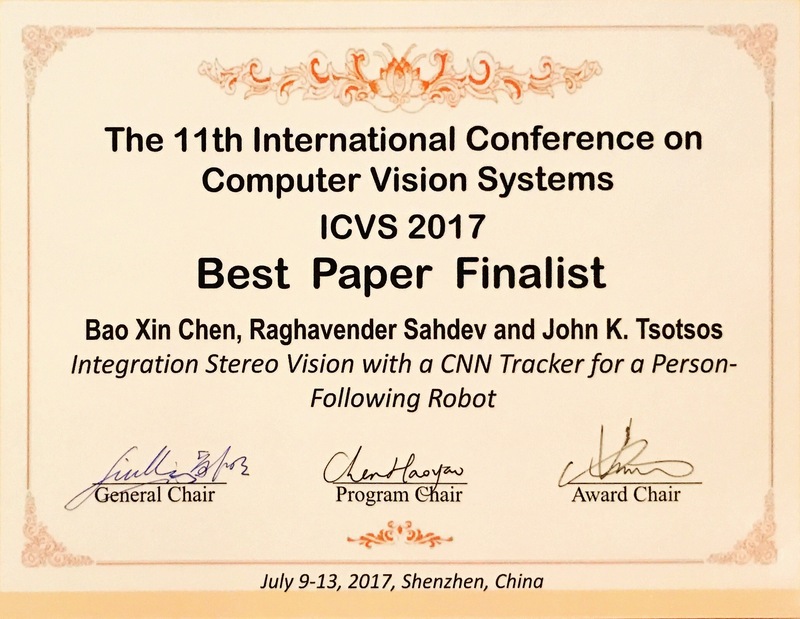 *Our paper titled "Integrating Stereo Vision with a CNN Tracker for a Person-Following Robot" was the Finalist for the Best Conference Paper Award at ICVS 2017. The robot is following the person in university corridors under crowded environments and is able to distiguish between 2 people wearing same clothes under occlusions, pose changes, etc.. The robot is able to follow the correct target under appearance changes, wearing/removing jacket, putting on/removing a bagpack, occlusions, tracking under similar clothes, etc. The robot follows the person inside a lab environment, corridor and a seminar room. The robot is able to follow the person in cluttered environments, illumination changes, occlusions, etc. The robot follows the person even when the target (human) cannot be transiently seen in the image. The robot replicates the local path for continuing the following behaivour. The robot follows the person in a narrow corridor environment with occlusions from another person.